20120102 - Up to a quiet house. Got some desk work done and the boys were home before we knew it. Had lunch with Gma&paW and then we tried to get the boys to gear down out of vacation mode. J&I finished his LEGO pirate ship and everyone played with their stuff while the college bowl games played. J&I ran out to pick up Panda Express for dinner. 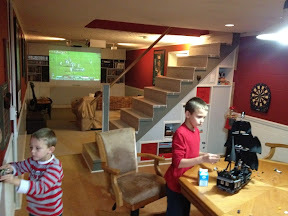 I got the blog updated through 2011 and the boys settled a bit more. All boys to bed and more football as L&I settled.